Don’t let your hormones wreck your life! Hemorrhoids: aren’t they a pain in the backside? How can homeopathy help with depression? Thierry Clerc practices in Cambridge (UK) as a clinical homeopath and a nutritionist. Thierry is a certified Metabolic Balance Coach. In order to know if the Metabolic Balance is the right approach for you, please contact Thierry Clerc for an initial review. While very effective, Metabolic Balance is not for everyone. The program includes an initial review of your individual medical history and your situation. This review will help us to define if Metabolic Balance is the right approach for you. Health is a journey, and in terms of diet, it is actually a journey back in time. Our genes have not evolved as fast as the modern first-world diet. Moreover, our genes are truly individual and this means that general nutritional rules are more likely to fail than success for most people. The Metabolic Balance program recognizes this fact. It provides a personal nutritional roadmap set in four stages, with food that can be eaten and food that need to be avoided for each stage. Like homeopathy, the science of Metabolic Balance has been created by German doctors. Their years of medical practice made them realize that obese patients were more likely to develop chronic disease, and also that they would take longer to recover from surgery. They decided to understand how to provide an individualized nutritional program based on scientific fact and rigorous metrics. Like homeopathy, Metabolic Balance is individualized. Your nutritional plan will be derived from physiological metrics and a blood analysis of more than 30 data. Myself, as your coach, will support you and customize the plan further depending on your needs and requirements. The beauty of this program is that its nutritional support plan provides all the information and support to tune up your food intake towards proper metabolic balance, reducing fluctuation of the levels of insulin and cortisone, which are known to be detrimental to health in the long run. Metabolic Balance is not based on calorie-counting, supplements and there is a long term strategy to help you eat most types of food in moderation. For this reason, if this approach is relevant to a client, it is in my view the most effective way to get healthy through nutrition. 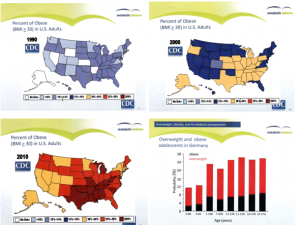 Obesity has been a modern epidemic in the rich world, starting with the leading country in terms of dietitian and medical doctors per capita in the world: the USA. Obesity became so critical in the 1980’s that the US Federal government started to track its population. 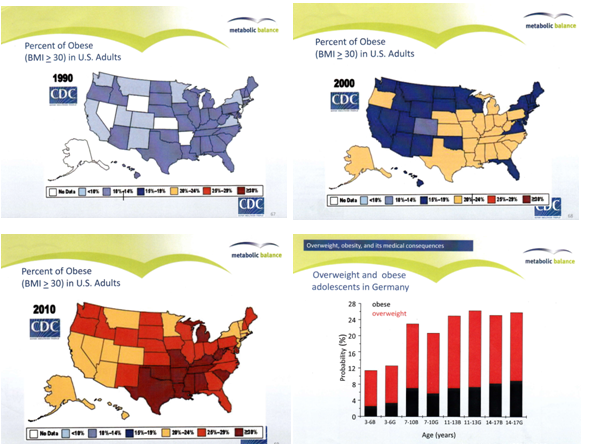 As seen below, in the 1990’s, not even all states could measure the state of their obese population. Just after 10 years (2000), the situation was even worse, bar for Colorado, the state of outdoor sports and the only light blue state. In 2010, the state of obesity was even more severe, and even sport-mad Colorado had succumbed. As shows the last slide, Europe and children are not anymore immune. To respond to that epidemic, the US saw an increase in Federal health advice, diet programmes, weight-loss medical drugs and supplements and new food such as fat-free ice-cream or “enriched bread”. As we can see with these maps. This has not worked at all. The simple answer is an individual programme that tracks how our body responds to any types of food in terms of insulin and cortisone production. These 2 hormones are known to increase weight. By working on a purely individual programme that reduces the insulin and cortisone rush, it is possible to retrain the body to re-use and eliminate fat. Imagine how harder life would be if you were carrying 2 bags of 5 kilogrammes of rice under each arm all day. Imagine how life would be if you were overweight and had just lost 10 kilogrammes of weight. For more information about the Metabolic Balance, please Contact us for a full review. Please, use our advice only as part of a treatment from our health practitioner. Also, refer to our Disclaimer and Legal Requirements.